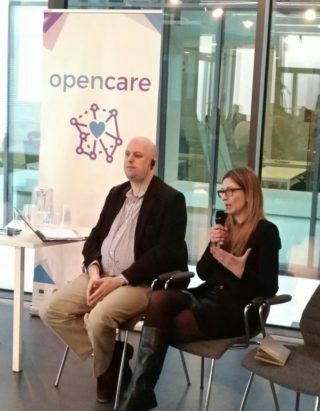 Angela Simone, as deputy coordinator and involved in the workpackage devoted to 3D printing in biomedicine, has been invited and taken part in the Final Conference of the EU H2020 OPENCARE project. The project aimed at creating and making open, collaborative health and social care new solution rooted in people’s everyday realities, needs and lifestyles thanks to the active involvement of makerspaces and citizens creativity. Angela Simone presented the experience from SMART-map, joining the session “Economies of care and innovation” addressed to explore collaborative economics and new technologies as means of contribution to radical innovation in care solutions for citizens and to discuss the economic impacts of innovation on the care world. Angela talked about the constraints and the issues for hybrid actors, as makerspaces and FabLabs, and small and medium enterprises to enter into the massive market of healthcare strictly regulated by regulation to guarantee safety for patients. Custom made solutions thanks to additive manufacturing miss clear regulation and standards. SMART-map industrial dialogues suggested the need of establishing novel rules but also to find out novel strategies to make better rules together with economical newcomers and actors and society, in line with RRI and the practice of “open care”.